Adrian Flux offer high quality, low cost Land Rover insurance covering everything from ex-MOD Land Rovers to top-end Range Rovers, including Modified Landys, Q-plates, lightweights, & classics. And green laning and off-roading use is included as standard on most policies. We also offer owner's club and limited mileage discounts so, along with our already competitive prices and specialist knowledge, you know you're on to a winner! Classic policies are also available with agreed value and limited mileage discounts being just two of the many benefits offered to eligible Land Rovers. 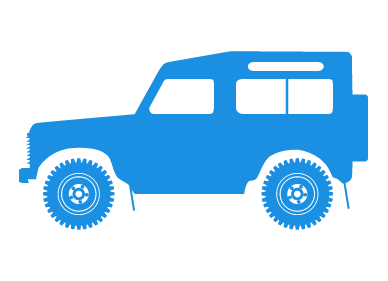 Whether you own a classic Series 1, a Discovery, a Freelander, Defender or even a Range Rover Sport, you can be sure that we will have a tailored Land Rover insurance scheme to suit you. All of our Land Rover insurance policies are designed to suit each customer's individual needs. We offer flexible and competitive quotes for all circumstances, sourcing the best available Landrover insurance scheme from amongst the many offered by our panel of over 40 insurers. Our policies for Land Rover Owners are already amazingly cheap, but you could save yourself even more money if you follow our simple tips for getting the best possible premiums. For younger drivers that will mean a saving of hundreds, or even thousands of pounds, but older drivers can save big too. Will you only drive a few thousand miles a year? Tell us, so we can get your Landy onto a limited mileage policy. If you've passed your test recently, get yourself a PassPlus, IAM or Max Driver qualification and we can knock up to 25% or even more off your first premium. Modified Land Rover Insurance - Make sure you tell us about all modifications to your Land Rover, even if they don't enhance performance. Some modifications might even reduce your premium. Most importantly, you will also get like-for-like cover on all your upgrades, so you won't have to fork out again if you need to make a claim. Are you in a Land Rover owners club or online forum? If not consider joining one. There are several great clubs for all the main Land Rover & Range Rover models and variants, so you're sure to find one you like, whether you're into off-roading or not. People who are enthusiastic about their car and learn all they can about it will take better care of it, which is why you could get an extra discount of up to 15%. Keep your Land Rover garaged if you can, and install the best alarm system you can afford and you'll pay less. Because our staff are used to finding a policy to suit unusual and even completely unique cars, they know which insurers offer the best policies and at prices to suit almost any budget. We do not believe Land Rover owners are best served by an on-line quotation system using computer rates. Instead each risk will be individually calculated by our expert staff. Our sales staff are insurance experts and along with our many tailor made Land Rover and Range Rover insurance schemes we believe we offer the best Landrover insurance quotation service around. Quicker & Cheaper landrover insurance rates by phone complete the call me form during office hours (9am to 7pm Monday to Friday & 9am to 4pm Saturday) for an immediate, no-obligation land rover insurance quote. ** Sample quotes are for premiums as stated covering drivers with a clean license and full No Claims Bonus (unless stated otherwise). Cars are assumed to be garaged unless otherwise stated. These illustrative quotes, valid as at 18/07/2006, are provided for information only and do not form the basis of any contract or tender. Policy excesses may differ, dependent on risk and scheme.